Through concentrated meditation, he worked at overcoming many obstacles, both in the outer world and in his own mind. Eventually he experienced a deep and lasting realisation of the true nature of the mind and understood what caused unhappiness and suffering. This lasting awareness of ultimate truth is called 'enlightenment'. It was at this point that he became known as the Buddha, which means the "Fully Awakened One", because he had woken up to the true nature of existence. Following his enlightenment, the Buddha then spent 45 years teaching others how they too could attain freedom from suffering and experience lasting peace and happiness. Rooted in principles of non-violence and loving-kindness, his instruction set many people on the path to their own liberation. Among these were numerous disciples who committed the Buddha's teachings to memory in order to pass them on to the generations that followed. These teachings became known as the "sutras". In this way the Buddha's wisdom and compassion have been transmitted down through the centuries and continue to help people to this day. Sometimes, people mistakenly think that Buddhists believe the Buddha to be a god. This is a misconception. The Buddha was a real man, albeit an exceptional one, who lived and died. He is revered because he undertook the very difficult task of understanding why there is suffering in the world. He succeeded in transforming his own suffering and awakening his wisdom and loving-kindness. In the process of doing this, he came to realize the true nature of things and to recognize that the only natural response to suffering is wise compassion. One of the major differences between Buddhism and other religions is its perspective on the human condition. While it is common in many other traditions to regard a person as innately flawed or impure, and thus, the life's task of that person is to seek redemption, the Buddhist tradition regards a person as naturally good and pure, and the life's task of that person is to awaken this innate purity. There are three different levels of Buddhist teaching and practice, each one forming the basis for the next one. They are often called 'vehicles' because they are the means for travelling the path to enlightenment. The first level is the Hinayana or 'Basic Vehicle'; the second level is the Mahayana or 'Greater Vehicle'; and the third is the Vajrayana or 'Indestructible Vehicle'. Each of these vehicles was taught by Shakyamuni, the Buddha at different times and places. Sometimes people mistakenly believe that they are different sects of Buddhism that are in opposition to one other. This is not correct. They are all interrelated parts of a single body of teachings given by the Buddha over his lifetime. 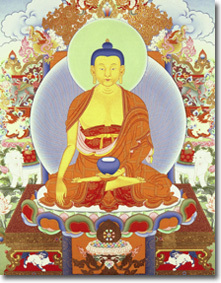 Mahayana is called 'the path of the bodhisattva'. A bodhisattva is a person who perceives the empty nature of all phenomena and cultivates the heart of great compassion, from which he aspires to free all living beings from suffering and guide them to complete enlightenment.